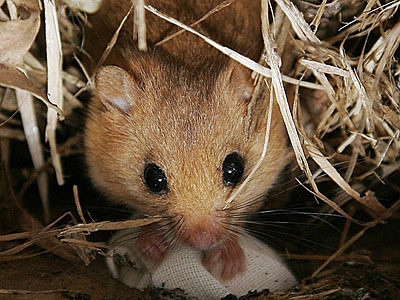 The hazel dormouse got its common name not only because it spends more than half its life asleep but also because of its association with hazel coppice. Coppice interspersed with standard trees use to be a common style of woodland management which favoured dormouse. Products made from coppice wood included hurdles, thatching spars and pea sticks.The timber from the standard trees was used for structural building. Many woods now have a higher value for amenity use rather than timber product and are reverting to high forest, a habitat which doesn’t favour dormice. However efforts are being made in a number of counties to reinstate the old coppice regime in some woodlands. There have been changes to the Habitats Regulations for protected species. General information on the amendments to the new regulations is available on the Forestry Commission website. This good practice guidance for routine woodland operations should maintain or improve the habitat for dormice and minimises the risk of harming individuals or damaging their breeding sites or resting places. If you follow this good practice, and carry out the operations as described here, we would not expect you to require a protected species licence. Harvesting– in favourable habitat for dormice avoid any harvesting operations from early June to mid-August to ensure breeding animals are not disturbed. The recommended time of year to work in favourable habitat is in the autumn and the scale of any proposed operations must recognise the sensitivity of this habitat for dormice. In more marginal habitat, containing a mix of favourable and unfavourable features, which may contain much lower densities of dormice, any harvesting operations between June and mid-August should be restricted to 10% of the area of marginal habitat available. Outside of the breeding period follow the felling and thinning guide as outlined below. In unfavourable habitat for dormice harvesting can proceed at any time of year, unless there is obvious evidence that dormice are present. Felling – Avoid felling more than a third of the area of habitat in the woodland, less for small woods, and retain remaining areas of habitat for at least 5 years. Thinning – Do not thin more than two-thirds of the area of suitable habitat in one year and leave the remaining undisturbed for several years. Extraction – where possible extract material using a forwarder rather than a skidder to reduce the risk of damaging nests on or near the ground. Coppicing – ensure coppicing is undertaken while dormice are hibernating (November to early March). Coppice no more than 25% of the area of habitat in any one year, and ideally less. Avoid unnecessary disturbance of the ground, where dormice may be hibernating. Site preparation – try to avoid scarification or burning up of brash, but if it is necessary, ensure all site preparation is done before the area becomes suitable habitat – ideally within a few months of felling. Mowing and swiping regimes – to limit the risk only mow areas of existing short vegetation; restrict swiping to the early autumn. Scrub cutting – If rideside and other scrub does have to be cut then aim to do this in winter and only treat a small proportion of the area in any one year. Maintain branch connectivity at intervals over rides and tracks. Track construction or other ground-works – avoid undertaking such activities during June to August and, where possible, take routes around areas of highest quality habitat. END NOTE: This information has been published by the Forestry Commission in an effort to provide guidance for woodland management in areas where dormice may be present. Please note that these documents are interim only and should be finalised some time. Woodland management for small woodland owners offering best practice to comply with European Habitat reglations. There is an excellent website at Hedgelink which gives lots of information on the UK’s native hedges, hedgerow conservation and hedge management. They have also produced a useful leaflet on the hedgerow_management_cycle. Habitat Management News from British Wildlife gives some advice on how pollarded hazel may benefit dormice. If you would like to have a go at building your own dormouse box there are plans available. There are also some plans for building a small mammal trap designed with dormice in mind. If you would prefer to let someone else build them for you Kent Mammal Group produces some good boxes at a reasonable price. There are instructions for using dormouse tubes that are available from ‘Sales’ at the Mammal Society and how to make your own dormouse nest tubes from drinks cartons.